Bighorn sheep, mountain goat and elk herds in the Roaring Fork Watershed are all the focus of Colorado Parks and Wildlife (CPW) studies that employ GPS tracking collars to determine herd movements, animal interactions and, in the case of elk, calf mortality. New in this effort is the involvement of Pitkin County Open Space and Trails (OST), which has budgeted roughly $92,000 in 2019 to help fund the tracking equipment; another $54,000 allocation is also contemplated in 2020. Three CPW studies are receiving OST support – a study of mountain goats and bighorn sheep in the Maroon Bells-Snowmass Wilderness Area, a study of the Basalt bighorn herd and an elk study that focuses on factors that affect calf survival, including the impact of human recreation on elk and elk calves. Fostering healthy herds of these revered wildlife species dovetails with the Open Space program’s biodiversity and habitat conservation objectives and will offer important information for the management of open space properties. The three projects are detailed below. This two-part study will focus on factors that influence elk “recruitment” rates (when a calf reaches adulthood, it is considered “recruited” into the herd). CPW uses calf-cow ratios as an index of recruitment; the ratio is the number of calves per 100 cows. Aerial surveys of elk are conducted in December/January to determine the calf-cow ratios within various herds, but the ratio is an imperfect measure of recruitment. Various factors, including cow and calf survival, affect the numbers. CPW intends to take a closer look into why some areas are experiencing a decline in the calf-cow ratio. The agency intends to collar cows in four study areas – one with a high calf-cow ratio and three with low ratios. A Pitkin County herd will be one of the three low-ratio herds to be studied. The effort will include capturing and collaring elk at Sky Mountain Park in March 2019. Cows will be collared and receive vaginal implant transmitters. Researchers will know when each cow is about to give birth as the transmitter will fall out. 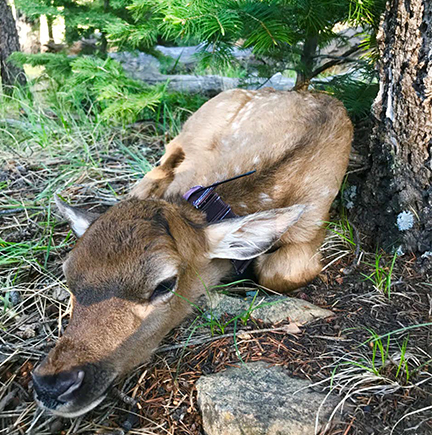 Ideally, researchers will locate the newborn calf and outfit it with an ear-tag transmitter or collar, allowing them to monitor the calf’s survival and the timing and cause of death if the calf does not survive to adulthood. As the second part of the study, CPW intends to place wildlife cameras in a grid pattern within select areas to observe elk and other wildlife with the goal of evaluating whether seasonal recreation closures and the timing of seasonal closures are beneficial to elk. Locally, Sky Mountain Park, Burnt Mountain or Basalt Mountain may be tabbed for the camera grid. Bighorn sheep are a native species in Colorado, while mountain goats are not. CPW manages both species for hunting and watchable wildlife opportunities. In the Maroon Bells-Snowmass Wilderness Area, wildlife managers are concerned that the two high-alpine species are competing for habitat. The goat population, first documented in the 1980s, has expanded, while the historic sheep herd has declined, according to CPW. In 2013-15, seven bighorn rams were collared to track their movements. As a next step, CPW has collared 22 goats and 7 bighorn ewes to collect data on their home ranges, movement and dispersal patterns, and overlap between the two species. The data will help CPW set hunting license quotas for goats with the goal of reducing the goat population and their potential for competition and overlap with bighorns. The Rocky Mountain Bighorn Society is also helping fund this project. A study initiated in 2015 involved collaring 10 ewes and four rams in the healthy Basalt herd in order to collect data on the herd’s home ranges and movement. CPW also hoped to assess the impact of a habitat improvement project within the herd’s range, but the habitat work was delayed and the 2015 collars are no longer functioning. CPW intends to outfit 12 sheep with new collars in 2019/2020 with the goal of assessing the effect of the yet-to-come habitat treatment and to determine whether 2018’s Lake Christine Fire on Basalt Mountain affected their distribution and habitat. The 2015-18 collar study received funding from the Rocky Mountain Bighorn Society and the Colorado Auction and Raffle Program.